All i can say is Jason Segal really fit his character well, a grown man whose enthusiasm sparks the film to life even before it started. I believe not many would be able to replace him in this movie. It was a fantastic fun ride to watch him. Amy Adams was below average considering her splendid lead role in Disney's Enchanted. but to be fair, her role was very minimal but could be done with more energy. 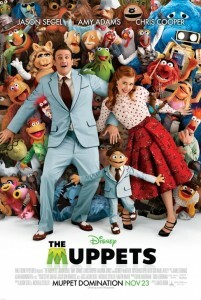 The muppets was.... what they should be, entertaining and delightful, full of the sparks of my childhood memory. A simple plot , of saving a run down memory filled theater blended with a fresh and witty approach. It's impressive that such a simple plot could be entertaining in such a manner. The flow was quick and snappy, moving from one scene to another, it wasn't tiring at all, it made it feel like there was so much more to be told. Of course, the best applause and a standing ovation to the puppeteers behind the muppets, amazing talents that have long been forgotten once again relived. A great mix of modern and classic songs, i expected nothing less from Disney. A cute collection of lovable characters with a simple but great way to tell jokes that would be otherwise labeled as unoriginal. Smart dialogues and precision timing kept the movie fresh. I simply enjoyed the film and the songs. There many cameos in the movie, can you spot them all? Family fun and a great laugh, feel good movie at one of it's finest. Once again, disney films are a great medicine for the tired soul, everyone should watch it, whether o not they know them.